Hello Guys. 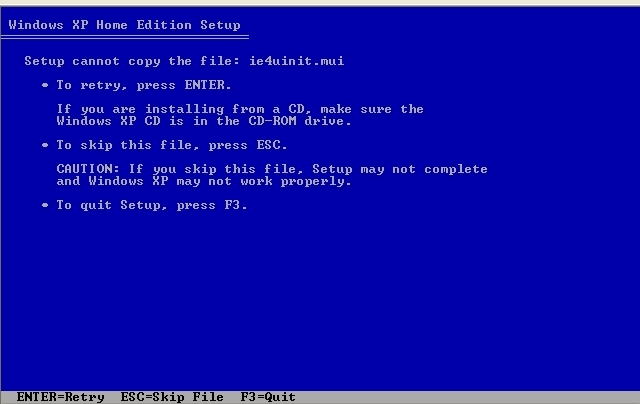 I copied my source files using WinNTSetup2_x86.exe of XP SP3 to the C: and the computer reboots and starts the install. I am using a Modded XP source that I integrated IE8 and Nov updates into . I get cannot copy any file with mui in the extension. I read all the pages and I am sorry if I am posting this and miss the answer. How did you integrated IE8? It has no integrate switch, surely for a reason. IE8 or wmp11, can only be installed via svcpack / runonceex method. 2- and that tool , will be run in GUI phase (not sure at which point it should run) , it will be basically a Chinese made custom driver pack with the gui (EasyDriver ) . 3- This tool if runs during windows install , it automatically decompress and install drivers from the 7z files . 5- and the most important point should be , that the windows should wait for the driver installation to finish . Hi maanu, alright here, hope everything is okay by you too. Sounds interesting, please send me additional "information" about this GHO image via PM. Is it necessary to format the target partition for a clean Win7 install with WinNTSetup? knows a way to do this please let me know. seem to be the clean way of installing. No, it's not mandatory. install will overwrite files and abort if there would be a problem. But yes there will be files remaining from old Windows installation. - junctions and symlinks in Win7 are created with full path. Even Mircosofts own tools like robocopy don't handle symlinks right. It might happen that deleting an offline windows switch the drive and start deleting files/folder one the current system drive ! hello guys i have a USB HDD and i want to install xp on one of the partitions by the way i have partitioned it to 4 partitions 3 primary and 1 logical partitions i have sucessfuly installed windows 7 on the first primary partition and it worked but xp always causes problems and i need xp because my computer is old since i had hard time installing xp i installed windows 7 but i dont have drivers for windows 7 the second is for file storage and it has encrypted truecrypt virtual image i wanted to install xp on the third partition i tried other xp to usb tools but all of them halted with BSOD i don't have CD so i want to install from from either hard disk to 3 usb primary partition or from one of the usb partitions to the other usb partition in this case the 3 primary. how can i do it with this tool. You can not! Only Windows 7 and later is supported for direct install to USB device. - does the latest version support install of WES7 or Thin Client to HD or VHD? If not - why exactly? - should your program run from a hard drive (for what OSs) or WinPE (for what OSs) to install the OS? - after an unsigned driver is integrated into the OS during install, will the OS still require to boot it only in Test mode (64-bit )? 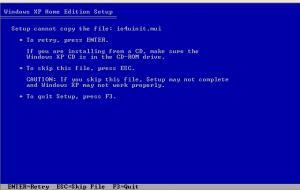 - what BCD commands do you use to enable install to a VHD (suppress error)? Also, I'm trying to run WES7 installed onto VHD on my real machine, inside a VM, and it gets 07b BSOD. What would you suggest to do possibly during install or now to make it run in both environments? Is this issue related to your tool not supporting Embedded? sorry JFX , i have been busy lately , i forgot the source , but i will again look into it , and PM you later. wit the power of PECMD , i managed to stop my WIN7PE and very begining (after loading winpeshl) , and it gives 2 options, 1 , continue PE , 2 . Install win7 from WINNTSETUP. now , i realised ,that a user MUST will format the target partition first , and i hope it is easy , as we already have BOOTICE there in your tool . 2. format the selected partition as NTFS , and Make it active . and your tool will in the end , write boot sector to it as it already doing . Could you explain, what benefits gives using ALIGN and NOERR options? Also, how ALIGN and UNIT commands choose block size from the list - should a user type it manually when formatting a drive? If yes, which size would you recommend for which OS? If not, how the size is chosen - based on output of FILESYSTEMS command? Thin Client and Embedded versions are not supported, one reason they mssing boot files. Another reason they often gives 0x7b or a blank screen with this direct install method. I never had the time to find out what really happens there. Unsingned drivers are only integrated if cmdline option -NT6 -ForceUnsigned -TESTSIGNING is used. there is actually no suppression of error, it would show error message. some people want to create VHD's in their forensic WinPE (no automount, readonly disk access). The 4 NOERR lines are added that this works now. ALIGN and UINT is usually not needed to set by user, Windows 7 default is okay in all cases. Newer harddisk, will often have a recommanded Aligment size, if this case user should select it. bootice is not included anymore, because of bugs and missing x64 version. an option to format i can properly add. but why not launch Partition Guru before or parallel to Winntsetup and use it to make partitions ready? There is no way to call PG before F1 . thats why i requested to have this native function at hand. thanks.